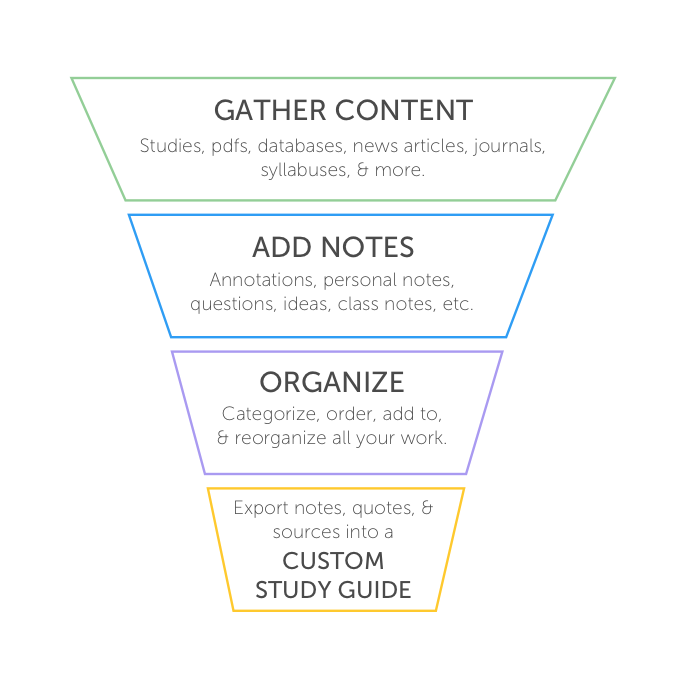 If you want help keeping your notes for a class organized, try PowerNotes. PowerNotes is a platform that helps you save, organize, and track all your digital content, whether it’s in the professor’s syllabus or something you found using Google. You can create your own organizational structure for in-class notes and pull in content from syllabus attachments, links, and anything else you find online. With PowerNotes, you won’t need to do anymore copying and pasting, toggling between tabs, and tracking down forgotten sources. PowerNotes reduces busy work, allowing you to focus on studying, writing quality commentary, and drafting. It also automatically saves citation information and URLs to reduce the chances of plagiarism. Using the browser extension to save important passages from their syllabus, links and attachments provided by the professor, stuff they find on Google, and their in-class notes (just turn it into a PDF). Creating Freeform notes to save non-digital information like print content, lecture notes, and your own questions and comments. Accessing the Project Outline to reorganize and review all the information you have gathered from sources. If you are writing a paper, you can use the Project Outline’s user interface to efficiently turn your notes into a writing outline. Utilizing the download feature to export all of your information to a doc or a spreadsheet. This way you can keep all your study materials organized in one place, and do it efficiently, so you can have more time to study for your exams or write your paper. You can install the PowerNotes browser extension here. You can get help, view video tutorials, and learn more about PowerNotes on our blog.